HydroWeed is one of Nature's non-chemical wonders! Absorbs oil and other hydrocarbons while it rejects water! Absorbs 15 times as much hydrocarbon as the equivalent weight of clay, making it much more practical and less expensive! Dispose of Hydroweed in your Garden! Made from a select type of peat moss, with processing that sterilizes the individual fibers and kills off insects, Hydro-Weed is a safe, environmentally friendly product. Surprisingly it won't absorb water, and will not release the oil and other hydrocarbons that it absorbs so effectively, making it ideal for cleaning up any type of oil or chemical spill. While peat moss is normally used in gardening to retain moisture around plant roots, Hydro-Weed differs in that it rejects water indefinitely, but instead locks up petroleum or chemicals and heavy metals, preventing them from leaking or washing out once they're absorbed. Any type of hydrocarbon leak on the surface of water be it an ocean, lake, stream or river presents a danger of contamination to the water as well as all living creatures, vegetation and shore lines, but sprinkle Hydro-Weed on the top of the spill and it will be 'locked up' so that it cannot stick to any living creature, vegetation or shore line. It also prevents the chemical from sinking to the bottom once it is in its fiber. A bird landing on the top of a spill treated with Hydro-Weed would simply take off again without a single drop of oil on its feathers. One pound of Hydro-Weed will absorb eight to twelve times its weight in medium weight oil and that's fifteen times more than clay absorbers. Hydro-Weed is non corrosive, non polluting and non toxic. It's completely safe and easy to use. Once the spill has been cleaned up, you can simply dispose of the Hydro-Weed by spreading it along a fence line or elsewhere for weed control. Nature will then provide the microbes who will eat the oil or chemical contained in it and the peat moss construction of the Hydro-Weed will benefit the soil just as any other peat moss would do. Hydro-Weed is ideal for those living near a body of water, boat owners, and anyone else who regularly uses chemicals or encounters spills. HydroWeed works just as well on dry surfaces or on soil as it does on water. It will selectively pick up a chemical spill on a wet roadway and leave the water behind. Hydro-Weed can be used as a packing, material in boxes containing shipments of chemical products, or anything else that may leak or create moisture. Every transporter should carry Hydro-Weed to safeguard against insurance loss and environmental damage. Every household should have an ample supply of Hydro-Weed to catch and absorb oil, grease and other hydrocarbons, and dispose of them in an environmentally safe manner. Nothing else does what Hydroweed does! A top ten chemical company last year had a 500 gallon spill. They cleaned the spill with a clay-based product used by most organizations. The spill took seven hours to clean and they had 55 drums of hazardous wastes to remove at $250.00 per drum. Recently they again had a 500 gallon spill, this time they used Hydro-Weed. The end result was the clean-up took two hours with only 14 drums of waste which they had the option to be incinerated in lieu of hazardous waste to be buried. A Fortune 500 chemical company in Delaware had oil leading and filling up their cement block walls. They hired an environmental cleanup company to drain the walls and clean the spill. The company started the cleanup by knocking holes in the blocks and letting the oil run out They used Hydro-Weed to absorb the oil by covering the floor. Hydro-Weed was ideal since it is non-tracking. The chemical company said they had never seen such a product work so well. The environmental cleanup company calls Hydro-Weed their magic powder. 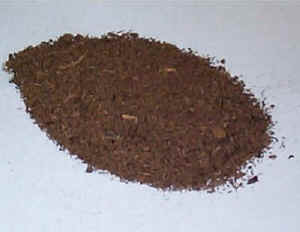 A non-toxic, non-abrasive organic blonde sphagnum peat moss. Absorbs hydrocarbons by encapsulating them on contact. Requires less product for storage and disposal. 1 lb. of HydroWeed will absorb approximately 1 gallon of oil. Absorbs hydrocarbons on contact and resists taking on water. Will reduce up to 90% of combustible vapors upon application due to its high vapor suppression capacity. Removes ALL free oil from spill sites upon extraction. Absorbs hydrocarbons on land, on hard surfaces i.e., asphalt, concrete, motor pool parking lots, and on water. How does Hydro Weed work? Absorbs hydrocarbons quickly with its capillary action and porous structure. Encapsulates hydrocarbons, including PCB's - on contact - taking in the hydrocarbon, rather than allowing the hydrocarbon to attach to the outer surface of the product. Has a 5% moisture level which aids in its high absorbency rate. Hydro Weed goes through a patented drying process that no other peat can measure up to. Easy to apply, easy to clean up. Leaves behind no messy residue after clean up. Safe for the environment - non-toxic, and biodegradable. Passes the North American Leachate Standards. Will not release captured hydrocarbons into the environment. Reduces man-hours required for cleanup. Absorbs all oil based products including PCB's and oil based paint. Requires less product for spill cleanup which cuts cost. Less product used means less volume hauled and disposed of in the landfill. Saves valuable landfill space. Can be incinerated. On its own will contribute 7,200 BTU's per pound during incineration (excluding POL products.) And leaves behind only 0.42% ash residual. Recycling and bio-degradability are major environmental concerns. Hydroweed is the answer to these concerns. Sometimes, the absorbents you use to clean up an oil spill can be more of a problem than a solution. Conventional absorbents work slowly when applied to a spill and may subsequently release the oil, violating regulatory leachate standards. Hydroweed absorbs on contact to contain the spill. Because of its high and immediate absorbency, it saves valuable cleanup time. Hydroweed - absorbs up to 12 times its weight. Less storage space is needed, transportation and handling are made easier and disposal costs are reduced. Hydroweed with its high absorption capacity results in low cleanup costs. While other oil absorbents may seem less expensive at first Hydro-Weed is actually more cost- effective. For example, it absorbs medium-weight oil 12 times more efficiently than clay. Hydroweed is an organic, non-toxic product which can be disposed of in a landfill or by incineration in accordance with regulatory guidelines. Hydro Weed is ideal for use on water. It is hydrophobic, i.e., it does not absorb water, and it is oleophilic, i.e. it quickly absorbs oil allowing for immediate cleanup. Hydro Weed absorbs 12 times its weight in medium oil! One pound of Hydroweed will encapsulate one gallon of oil. One 44 liter compressed bag (17 gallons un-compressed) replaces 450 lbs. of clay! Hydroweed will not release soaked-up oil. An independent laboratory test has shown that HydroWeed exceeds Leachate standards in the united States and Canada when used to absorb oil containing PCBs some organo-chlorinated pesticides, cadmium, chromium and lead. 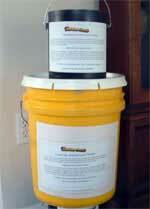 Instantaneous, water-repelling cleanup agent for industrial and marine oil spills. There are three proven methods. Reduces man hours to cleanup spills. This means land filled saves valuable landfill space when compared to other products. Reduces hauling costs from the spill to the landfill. Meets the U.S. and Canadian leachate standards. land filled will not allow encapsulated hydrocarbons to escape into the environment This is of great value to companies with an environmentally conscious agenda since Hydroweed is a natural organic absorbent containing NO CHEMICALS or other ADDITIVES. Can be incinerated! On its own will contribute 7,200 BTU's per pound during incineration (excluding hydrocarbons). This makes an excellent alternative fuel! Generates only 0.42% of ash residual per pound after incineration. Many cement kilns and coal generating oil or coal fired plants could use hydroweed saturated with hydrocarbon in their manufacturing process. Hydrocarbons will biodegrade 25% faster. The hydrocarbon will become nutrients for the soil. Remember once Hydroweed has encapsulated the hydrocarbon it will not release it into the environment. Retention: Meets leachate standards. EPA 131 1-Paint Filtration 9095, Title 40 of the Code of the Code of Federal Regulations ; California Testing. Hydroweed does not generate electrostatic charges. Licensed in the State of California and Florida for both land and water use. Chosen to be used in Alaska. Currently being used by all branches of the united states Navy, Army, National Guard, Marines, Air Force and possibly the Coast Guard. I just wanted to let you know that we ordered HydroWeed because somehow heating oil started getting into the crawl space under my daughter's house, causing an unbearable smell in the house. We pumped out what was under there with her sump pump but it kept seeping up from the ground. I found you and your product during an online search and decided to give it a try. When my husband crawled under her house and started putting the HydroWeed down he was utterly amazed. He spread it everywhere he could actually see the oil film or the little pools of oil. We used all of the 5 lb. bag and then all went out to eat. When she returned home in about 3 hours, she could already tell a big difference in the odor in her house; it had diminished considerably. Thank you so much for your wonderful product. I just ordered the larger size to keep in case the ground gets saturated with water again and the oil that's under there rises to the surface again. Again, thank you.